Each Nookal user can set up their Diary based on their preferences without affecting what other colleagues see in their accounts. Different preferences can be set for each accessible Location. Below explains the different viewing options and how to modify them. 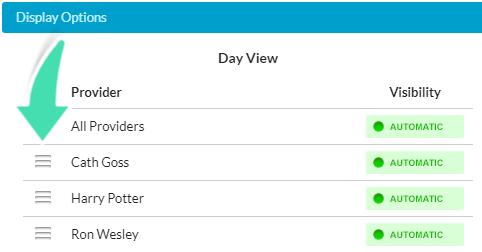 Choose which providers are visible on your Diary and reorder their columns. 1. Click Options in the top right corner of the Diary. 2. 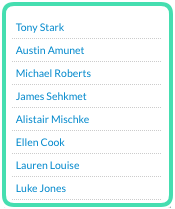 Reorder the Provider columns by clicking the 3 dashes button to the left of a Provider’s Name. Drag and drop each Provider to change the order. The name at the top will be the first column on the left in the Diary. 3. Choose each provider’s visibility by clicking the option under Visibility next to their name or choose the same for all the providers by clicking the option next to All Providers. You can choose between a few options regarding time and appointment displayed. 2. Tick the box next to any options you wish to enable. Hide Clients: This will hide client names if your diary is visible to other people who shouldn’t see names. Auto-Scroll: This option will auto-scroll to the current time of day when navigating to the Diary to easily find current appointments. Show Times: This option shows the time next to the cursor on the Diary. 24-hour Times: Shows appointments/classes in 24h-hour format instead of 12-hour format. Start Time: Decide on your Diary’s start time. End Time: Decide on your Diary’s end time. Be careful when setting up your start and end time to make sure there are no bookings falling outside of these. Any bookings outside of your start and end times will not be visible in the Diary. Day view will allow viewing the daily diary of each provider set to view for the Location. 1. Click Day at the top right corner. 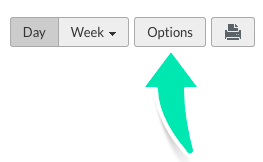 Week view allows seeing the week of a specific provider for that Location. 1. Click Week at the top right corner. 2. Select the Provider from the dropdown list.